TLDR: Horrible air quality conditions will be eradicated by a series of troughs that will impact the region tomorrow morning into Monday. The valley floor could see a few inches, while the mountains are primed for a big-time snowfall event. Today was a cold and dreary day in the valley with a visible layer of haze, courtesy of the inversion trapping pollutants at low levels. PM 2.5 readings from a station at Hawthorne Elementary exceeded 60 micrograms per cubic meter. In the mountains, skies were still cloudy, but temperatures were ~15 degrees warmer at the ski resorts (due to the inversion causing warming temperatures with height). Thankfully, the inversion will mix out tomorrow and the pollutants will be cleared from the valley as a trough moves into our area. Not only will air quality improve, but we will see snow from the mountain peaks all the way down to the valley floor. Short Term Forecast (Saturday Night- Monday Evening): A series of disturbances will impact the Intermountain West beginning tomorrow morning and continuing through Monday. While I have included Monday in this description, I will likely focus on Sunday and we will post refined details on Monday in tomorrow’s forecast. 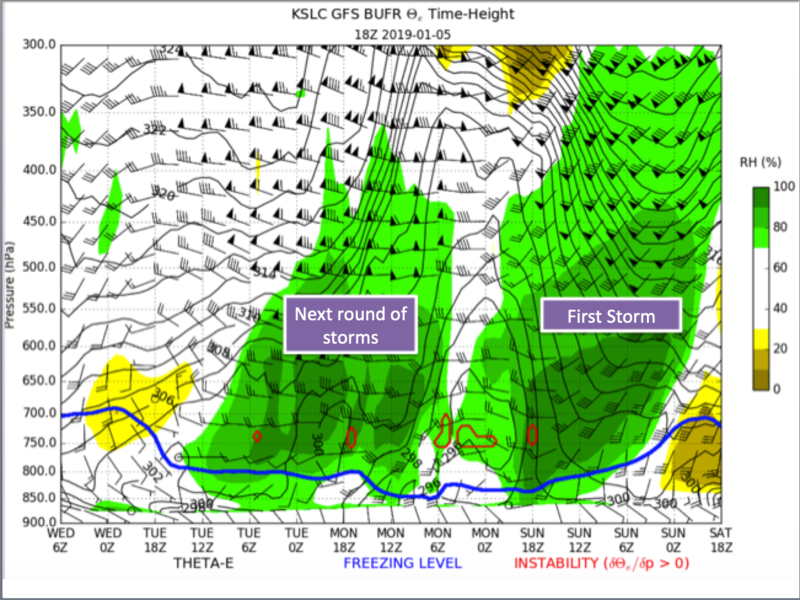 The timing of these disturbances is shown below on the time-height cross section at KSLC. The shaded green colors indicate moisture. The first trough will impact our area beginning tonight in the overnight hours. This deep upper-level system is currently making its way eastward from the Pacific. As the disturbance enters the Intermountain West, the winds will be out of the south, which will keep the freezing level elevated off the valley floor until mid-day on Sunday. This southerly-southwesterly flow will allow for plenty of warm, moist air to be advected into the region, further fueling the storm. Precipitation will begin to fall as rain in the valley and snow in the mountains in the overnight hours into early Sunday morning. While plenty of moisture is in place, the limiting factor for the central Wasatch and Salt Lake Valley area could be the westerly component of the wind beginning tomorrow. When the flow is out of the west, it can be blocked and result in downsloping off the Oquirrh Mountains. This will create a shadowing effect (drier air) for the Cottonwood Canyons. This would result in the Ogden and Provo areas receiving more snow than the SL Valley and Cottonwoods. Needless to say, this is not the ideal circumstance for tomorrow. If the flow can shift to a more west-northwesterly component, we will be in better shape. Park City will likely be shadowed no matter what given the flow direction associated with this trough.. Thus, their snowfall totals will be limited through Sunday. Currently, models like the High-Resolution Rapid Refresh aren’t resolving this possible blocking. Below is the current forecasted radar reflectivity.. 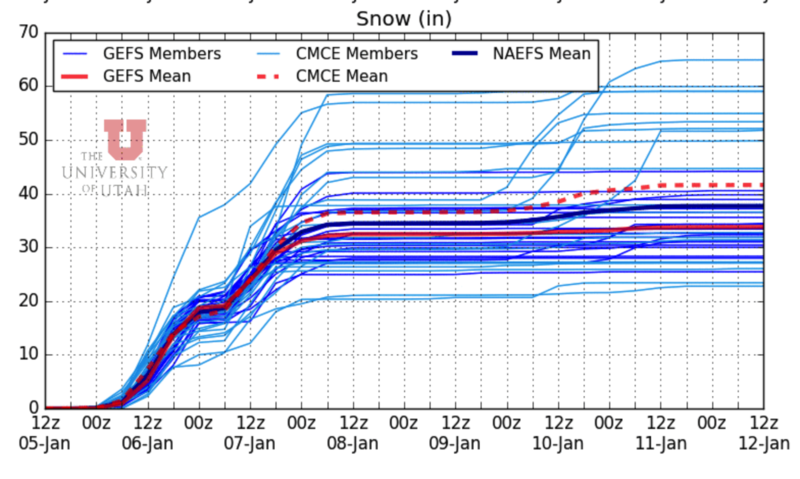 Regardless, tomorrow should be an awesome storm day with free refills for much of the Wasatch. More tomorrow on whats to come on Monday!